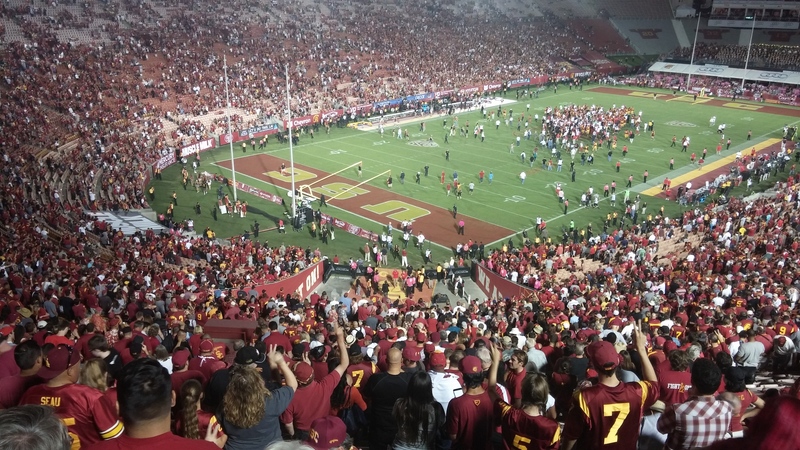 On a night that featured a little of everything, the 3-3 Trojans defeated the rank #3 Utah Utes by 3 scores. The threes didn’t stop at that for this game. The win coming despite needing to use the third-string center, Khaliel Rodgers. His battered offensive line unit only gave up three sacks despite only Damien Mama being in the position he started at at the beginning of the season. True freshman linebacker, Cam Smith also had a career night, picking off Travis Wilson three times. Verging on irrelevant, Threes is a game created by USC alumnus, Asher Vollmer. I’m sure it had something to do with the win against Utah. USC managed to punt only four times in the win. Crap, that’s a CommBro Breaker™. I’m done with this three thing. One of the best parts of this win is that the team still has not dropped into a losing record since 2001. In Pete Carroll’s first season, the Trojans were 2-5 to start the season, but finished at 6-6. The last time USC closed with a losing season was back in 2000 with a 5-7 record. You’d have to stretch all the way back to 1991 for the next one. With the Trojans teetering on the edge of a tailspin, the win was crucial. Not only did Coach Clay Helton manage to prevent a losing season, but he’s kept the team in the hunt for the Pac-12 South title. If—and that’s a big if—USC runs the table and Utah loses one more conference game, the Trojans will likely get a rematch against Stanford for the Pac-12 Championship. We can only hope. Either way, this game showed huge improvement from the very start. Upon winning the toss, the Trojans elected to defer. This was something we had not seen in a long time. Helton on not taking the ball after winning the toss, said Cody Kesler told him: "Coach, let's make a damn statement." The decision proved to be favorable as USC struggled at the start. The Utes jumped to a early 14-7 lead, but the Trojans made sure that would be their last. Cam Smith’s three interceptions and team leading tackles should definitely earn him player of the game honors. The Pac-12 already recognized him as the defensive player of the week as well. Not only was he able to stop three of 11 meaningful drives (Utah had two more, but at that point, the score was well out of reach), Smith’s 122 yards outgained either team’s entire rushing attack. Coupled with zero turnovers from the Trojan offense, the Utes didn’t have much of a shot to get back into the game. The Utes were almost shut out completely in the second half. They scored a lone touchdown with four minutes left to play. Su’a Cravens even denied the final deep shot by Wilson with an interception of his own. The defense allowed only two explosive plays throughout the game. One was the 66-yard catch and run touchdown in garbage time. The other barely qualified as it was a 22-yard gain by Devontae Booker on a simple swing pass. Booker’s running was kept in control all game. His longest run of the day was 12 yards and he only managed 62 yards overall. This forced Utah to rely on their passing game, proving fatal. This is despite losing safety, Marvell Tell III, and playing walk-on Matt Lopes. Even two iffy pass interference calls against Iman Marshall ended up moot for the Utes. A huge part of such a sure-handed destruction were the adjustments made since playing Notre Dame and the adjustments made during the game—the likes of which has not been in many moons. Playing with a third string center and getting low snaps? Kessler moved under center more. Blocking not going well with true freshman Chuma Edoga in at right tackle? Put in two fullbacks. And when we were up by a fair amount, he ran the damn ball. When the run from the tailback position wasn’t going well, Helton called a fullback dive with Adoree’ Jackson in at tailback as distraction. Furthermore, USC managed to put together a 10+ play drive for a touchdown for the first time this season. They even did it a second time with a 17-play drive that churned away more than half a quarter (8:53). The Trojans punted only four times and only went 3-and-out twice. The penalties against USC were shaved down as well. Overall, they were flagged 5 times for 49 yards. If you take out the sketchy PI calls, it would’ve been 3 penalties for 20 yards. Either way, it was a huge improvement. The best part? Zero penalties called on the offensive line. Unfortunately, that didn’t stop the Pac-12 officials from getting face time. It was like they were doing a football rules clinic. There was the usual, like announcing why every incomplete pass wasn’t an intentional grounding. They added an explanation of why it wasn’t roughing the kicker to their repertoire. Next thing you know, they’ll be announcing whether the grass is regulation length (we’re looking at you, Notre Dame) or if a quarterback has a legal amount of air in the ball. Imagine it with me: “Number six of the offense will not be flagged for underinflated his football. The measurement is between 12 and 15 pounds per square inch.” They could say this before every snap, just so you can know for sure, man! So helpful. Thank you Pac-12! They should’ve announced something about JuJu Smith-Schuster’s shoe flying off. The game could’ve gone a lot worse had Wilson not stared down his receivers. And the missed field goals are going to become a problem at some point. By the way, thanks for not rushing the field. They were even taking down the goal posts in anticipation of it. Go rush the field at Vanderbilt or something. Misleading Stat of the Week: Clay Helton has only played against ranked opponents as head coach. Context: 3 out of 3 opponents were ranked. Again, too small of a sample size. Next week, he’ll coach against Cal. They just dropped out of the rankings. Why’d they have to go and break the streak?